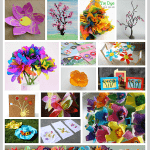 Get ready to make one of the most gorgeous flower crafts out there! 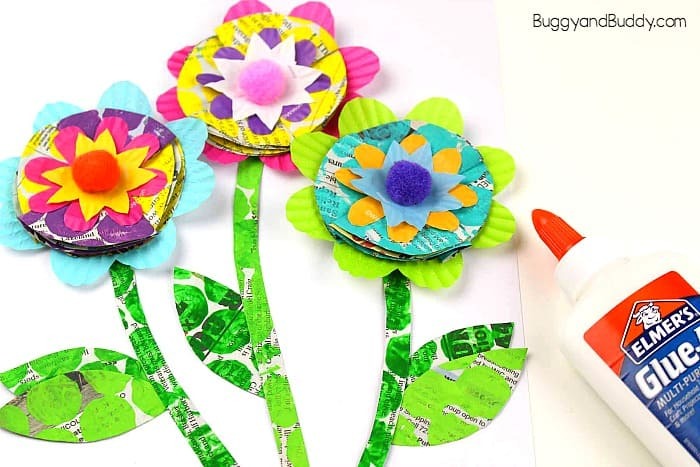 This mixed media flower craft for kids is so colorful and uses all kinds of cool materials like newspaper, bubble wrap, and cupcake liners. It’s definitely a fun one! 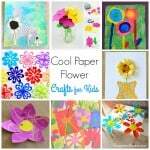 Follow our Crafts for Kids Pinterest board for even more ideas! 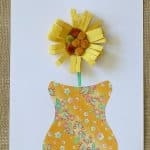 This mixed media flower craft is absolutely gorgeous! 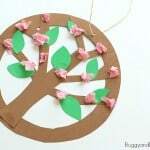 (Imagine a whole class set of these hanging up on the wall- wow!) 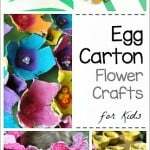 I love that it can be done with a wide range of ages and is perfect for spring, a gardening unit, and would even make a beautiful decoration for the front of a Mother’s Day card. 1. 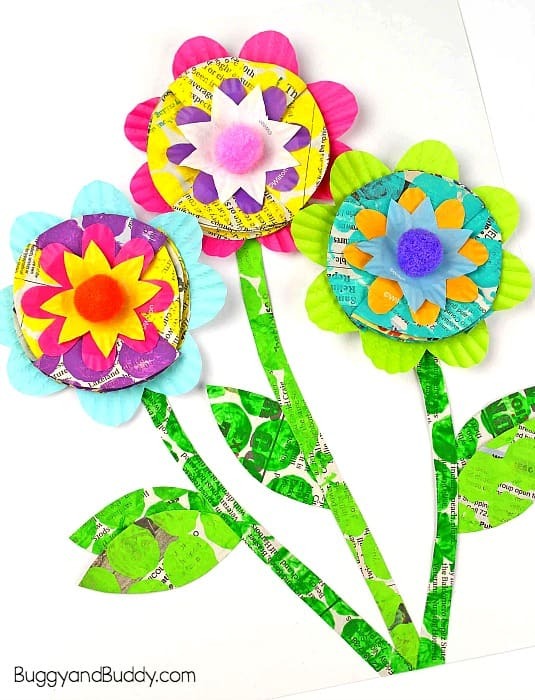 Paint a piece of bubble wrap with brightly colored acrylic or tempera paints and stamp it down onto a sheet of newspaper to make a textured print for your flowers. 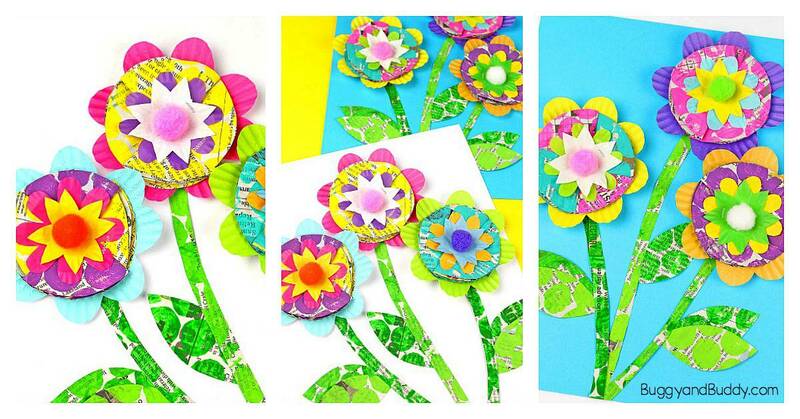 You can even make a few different colors of bubble printed paper so you end up with a variety of colored flowers. 2. Allow the paint to dry completely. 3. 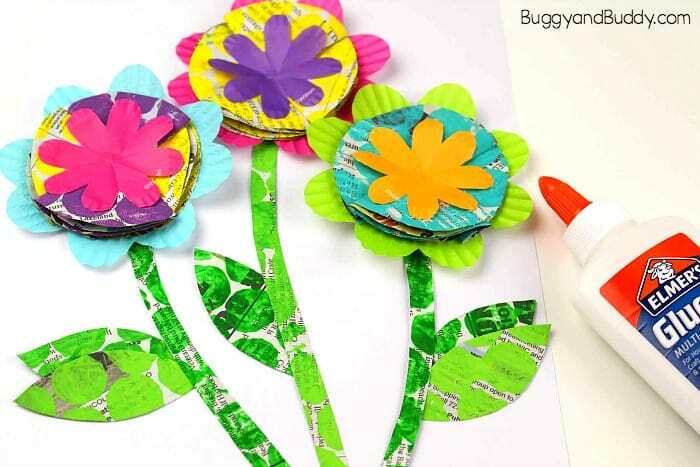 Use a circular object to trace onto the newspaper to create your flowers. Cut our your circles. You will need 4 circles per flower. 4. 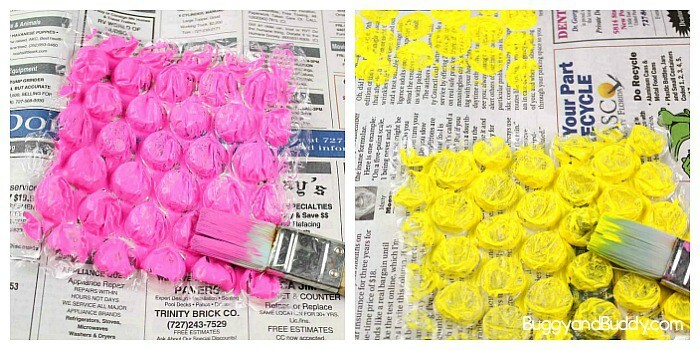 Paint a separate piece of bubble wrap green and stamp it onto a sheet of newspaper. Allow it to dry completely. 5. 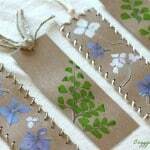 Cut flower stems and leaves from the green stamped newspaper and set them aside. 6. Now it’s time to start creating the flowers. Start by folding the bubble print circles (you cut out in step 3) in half and then in half again. Be sure the colored side of the newspaper is facing out. 7. 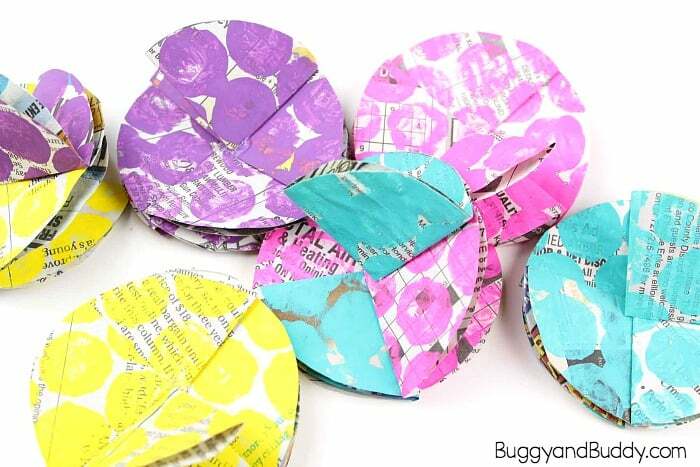 Take four folded circles and glue the corners of each folded circle together to create a circular shape. (Be sure to glue the folded corner part and not the rounded open part.) You can do all one color or mix up colors for each flower. Set your glued flower aside. 8. Flatten out a standard-sized cupcake liner, fold it in half and then fold it in half again. 9. Round the outside edge of the cupcake liner. 10. 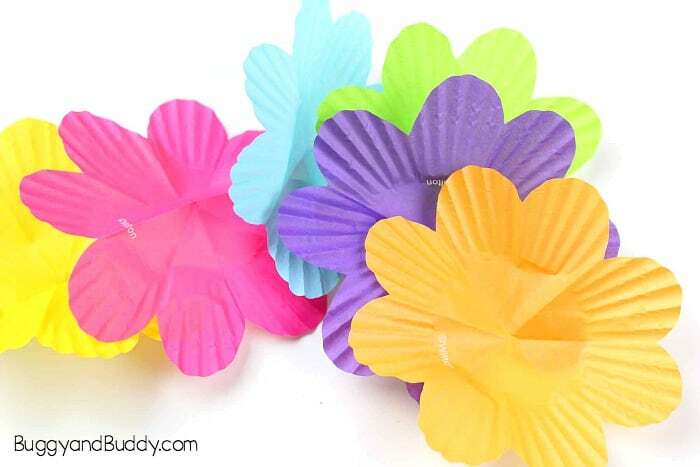 Open up your cupcake liner to reveal your flower shape. 11. Repeat this step for each flower you’ll make. 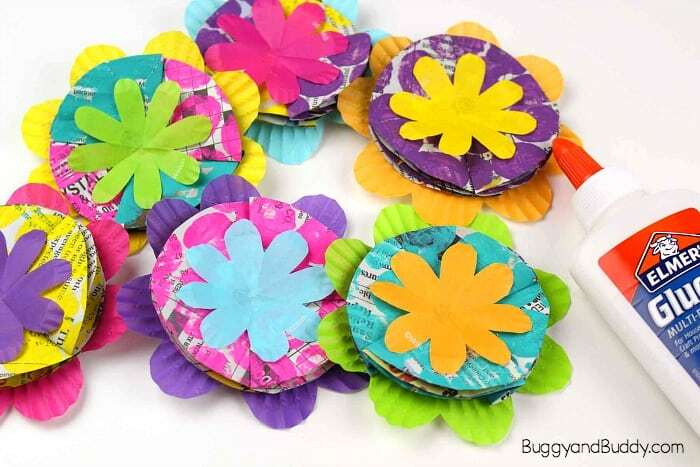 12.Repeat the steps above mini cupcake liners. 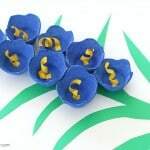 14.Glue the stems onto cardstock or construction paper and then glue the flowers on top of the stems. 15. Glue the leaves onto the sides of the stems. 16. 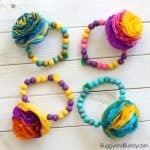 Glue a pom pom in the center of the flowers. That’s it! Aren’t these just so gorgeous? You could use them on the front of a homemade greeting card or display them as artwork to make your home or classroom bright and cheery! 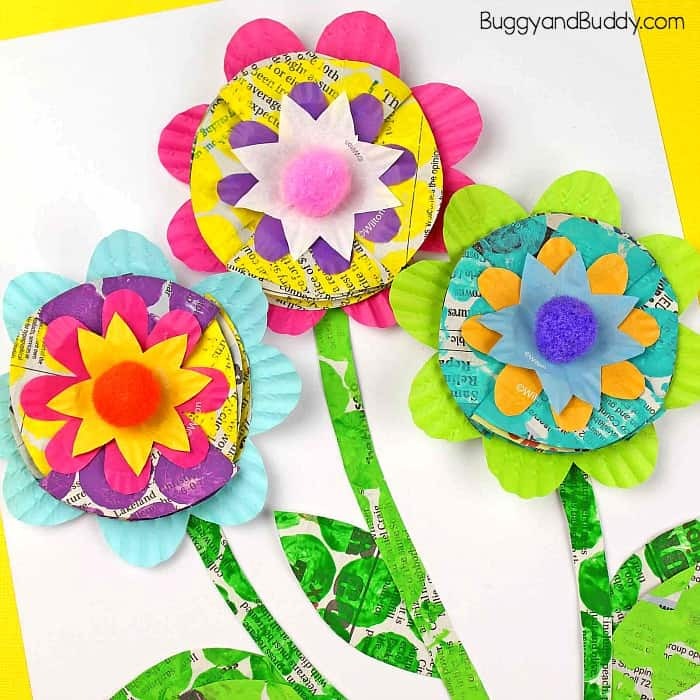 See more crafts from Buggy and Buddy!